The other day the world learned about an unpublished Ernest Hemingway short story. If there had not been a Mark Twain first, would literature know Hemingway’s writings at all? Could there have been an Isaac Asimov, Stan Lee, or Gene Wolfe without a Verne or Burroughs? The J.K. Rowling body of work without an Austen or Tolkien? Similarly, all of today’s rock music can be linked to direct influences — to bands such as Ramones, Led Zeppelin or the Beatles, which, of course, had their own precursors. Would jazz exist in its current form without the innovations of Armstrong and all those who inspired him? 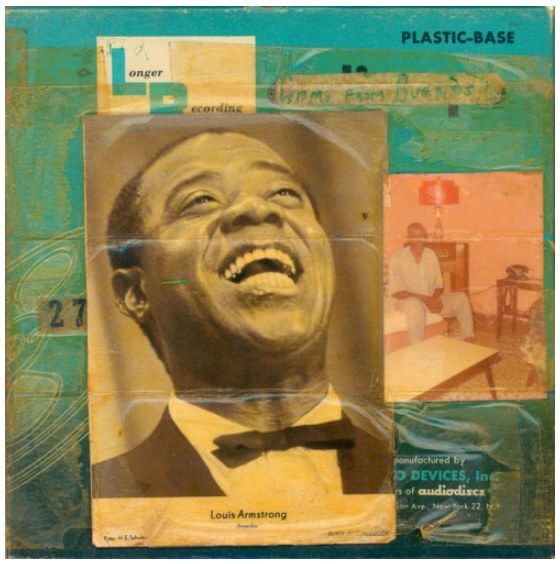 Imagine a contemporary musician saying, “I really haven’t paid attention to any music that was recorded before I started to play.” And yet, not infrequently, collage artists will boast that they have little use for art history (all the breakthroughs of bygone creators who dug the swimming pools in which they now frolic). It is argued that modern artists were the first to decide that visual art would be about art, rather than subject matter. Nonsense. Art has always been about art, because it always has been structured on prior foundations. The idea that any artist can burst on the scene as an original is absurd. Nobody who comes out of early childhood with any level of awareness has not built an inventory of perceptions — countless images from the culture around them. Each of these individual influences involved creative activity based on another bank of stimuli, and so forth, back to the first proto-human who picked up a piece of charcoal to make interesting marks on a stone (and was probably knocked on the head by another who judged the action as irrelevant to group survival). Perhaps I have belabored my point. Perhaps it is a point that anyone who reads this would not need emphasized in the first place. 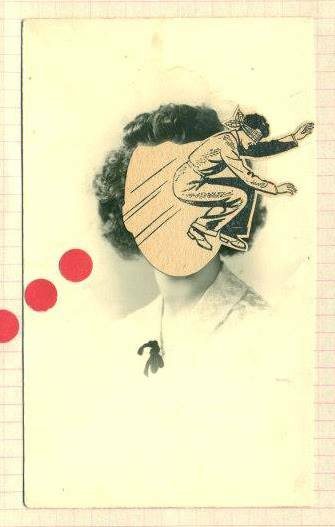 Isn’t it obvious to us that no art form is more about all these churning influences from untold visual decision makers — painters, printers, illustrators, photographers, designers — than the medium of collage itself? So, let us all continue to study the collage artworks of the explorers who came before us, to trace the direct lineage of their concepts and techniques, to recognize that valuable inheritance in the work of our peers, as well as in the composition taking shape on the surface before us, and then, fully informed, to push confidently into the second century of collage. 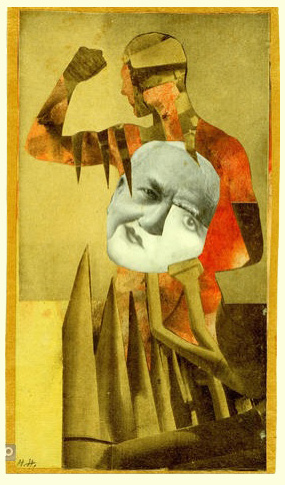 The evolving medium of collage betrayed its sense of humor from the outset, over a hundred years ago. There are countless variants of humor — satire, sarcasm, incongruity, hyperbole, mild irony, outright farce — to cite merely a few. Most, if not all, have presented themselves in a collage format during the tumultuous century that followed. 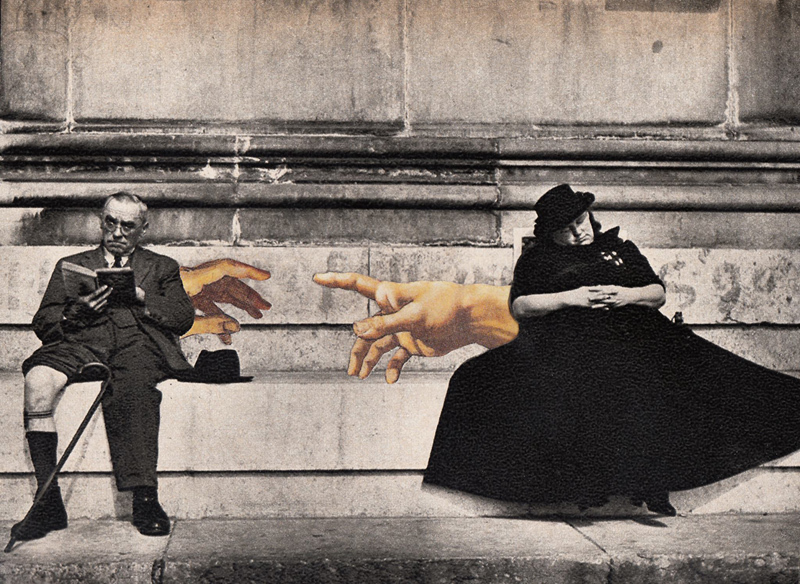 From my point of view, the humor we may find in Dada and Surrealism are byproducts of the movements’ overarching goals. 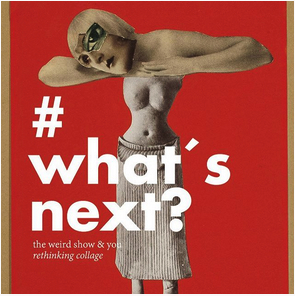 But, we might ask, was the avant-garde intending to be funny at times, or were they deadly serious about weaponizing shock value as a visual tactic, bequeathing any laughs to those of us who would arrive many decades later? On the other hand, how can poking fun at established traditions and ideologies not be classified as humor? 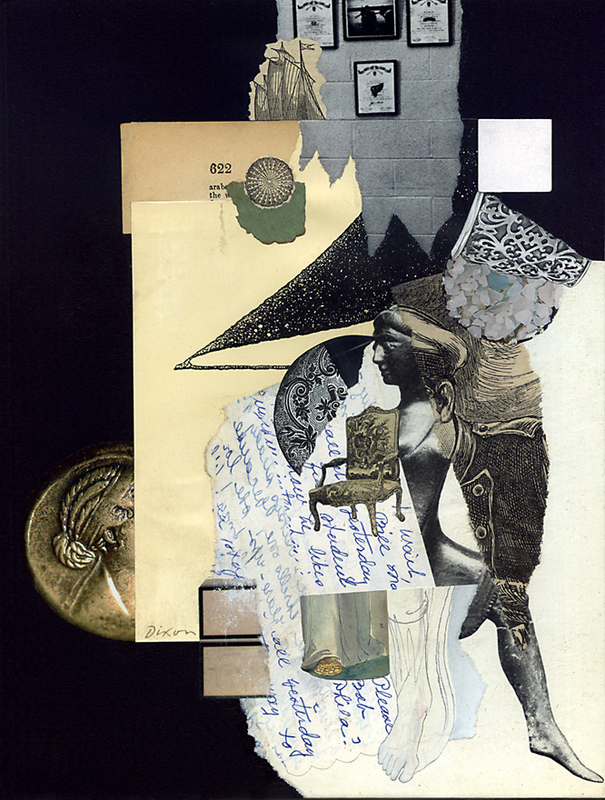 I welcome the thoughts of all readers who have chuckled at the work of Hannah Höch, or sensed dark amusement in a Max Ernst composition. Even when outrage from a target group is the primary objective, a subversive artist also may be hoping to elicit a humorous response from those of like mind. As we know, humor, like beauty, rests in the eye of the beholder. 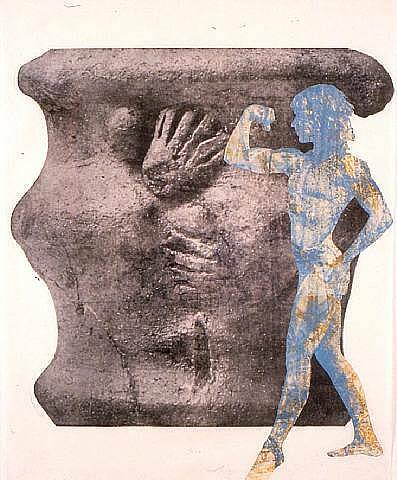 Eduardo Paolozzi created his whimsical Bunk! 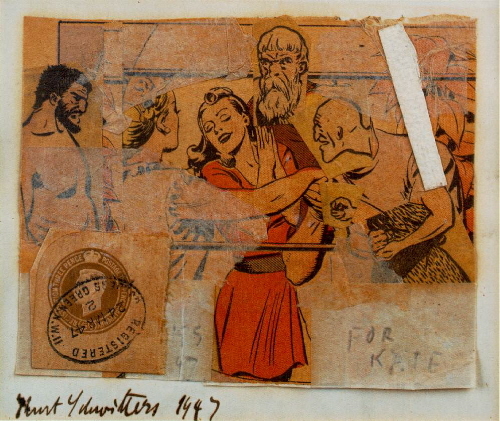 collage series in 1947. 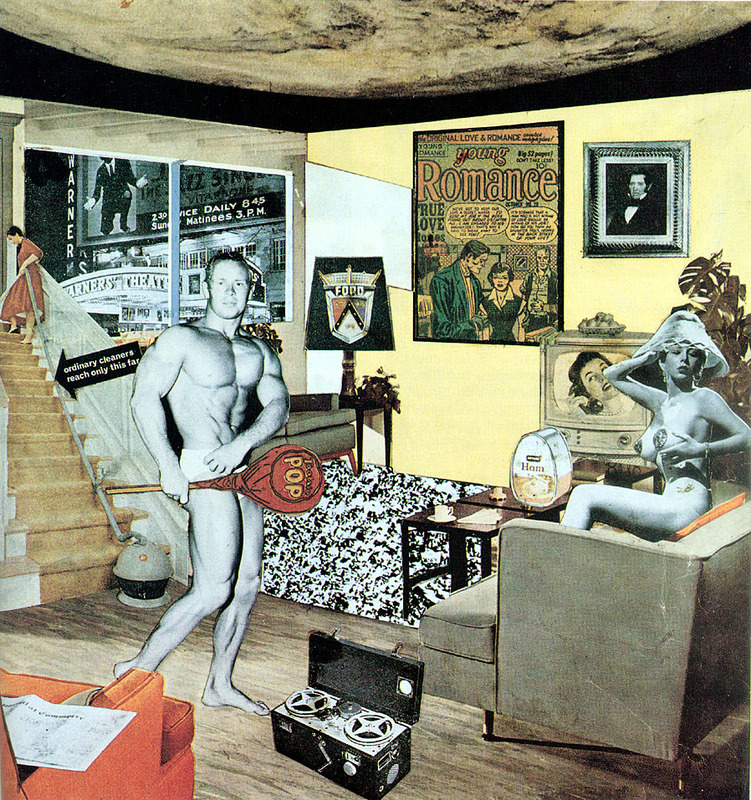 During that same year, Kurt Schwitters, with the bulk of his far-reaching breakthroughs behind him, displayed his acknowledged sense of humor when he created “For Kate.” Both were envisioning the coming thing — Pop Art (Popism) — a movement to throttle the contemporary scene some 20 years later. Steve Martin got it right when he explained, “Chaos in the midst of chaos isn’t funny, but chaos in the midst of order is.” Did Mark Twain anticipate a Mel Brooks and how the art of stimulating laughter could enable a towering denunciation of fascism? Are there times when creativity’s greatest power is best unlocked with a joke? 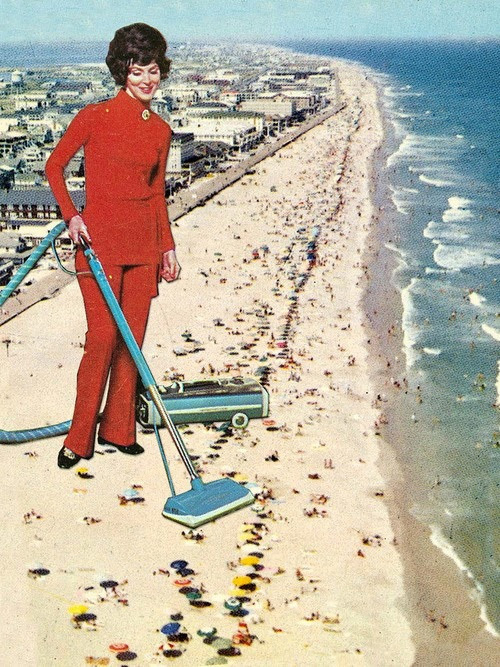 Now indulge me as I feature a few examples of humor in collage from artists that have touched my funny bone. I must admit that this subject brings to mind Terry R Flowers, perennial wit in the art form. 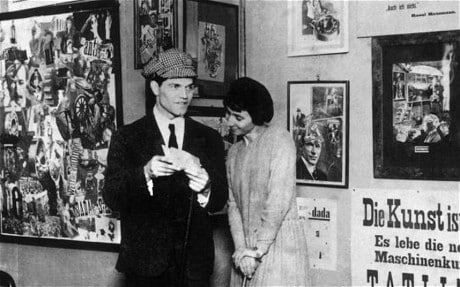 It would be too easy to fill a screen with an array of his artistic wisecracks, especially in his role as veteran collaborator with Robert Hugh Hunt. Some of these practitioners rely on a minimalist, juxtapositional approach — a sort of comedic “one-liner” — while others evoke a wry quality with a more complex effect. Perhaps nothing is more subjective than humor, so let them speak for themselves. You’re encouraged to bring others to my attention, and I’ll prepare a follow-up entry! 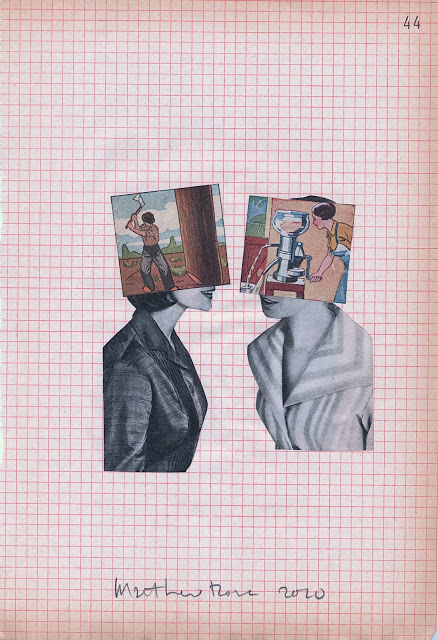 Top collage artists I never even knew about !!! 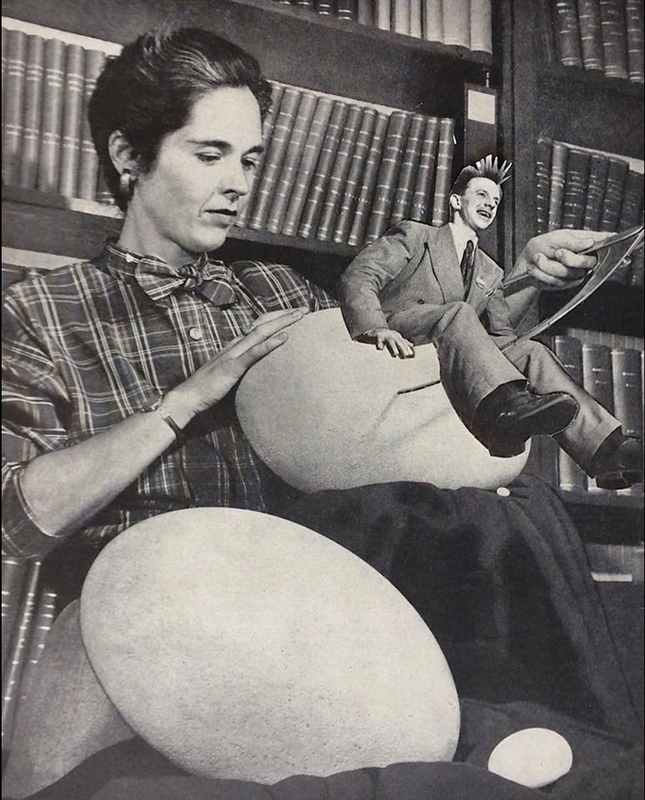 What does this have to do with collage? 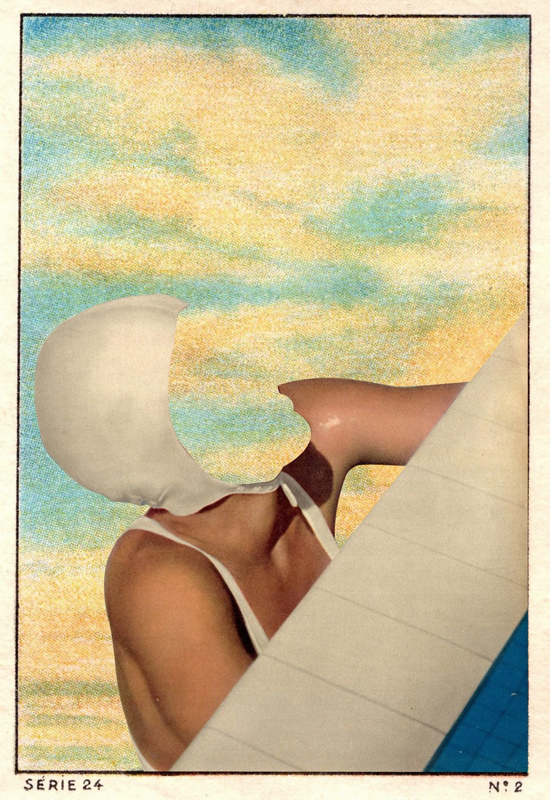 Well, I just paid a visit to a page at AnotherMag.com (in response to the aforesaid bait), and I learned for the first time about three collage artists who were new to me, a working artist who purports to ruminate on “all things collage.” In this particular case, there may have been an explicit effort to achieve an overdue gender balance for a post intended to spotlight the Höch retrospective at the Whitechapel Gallery in London, but one could question the absence of Paolozzi, Rauschenberg, Johnson, Hamilton, or Kolář. 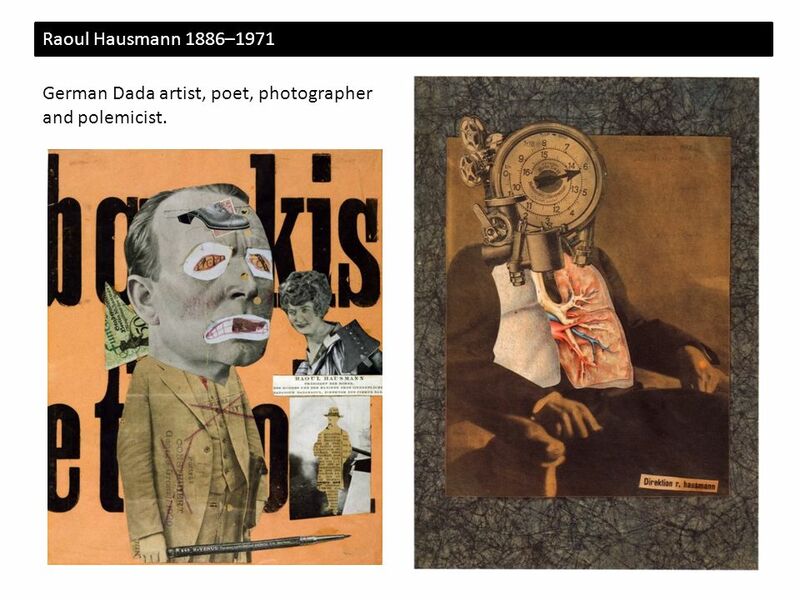 To not include at least one of these men as a key figure in the history of collage brings no meaningful discredit on any of the artists, but only on the list. (And that, too, is just my opinion). 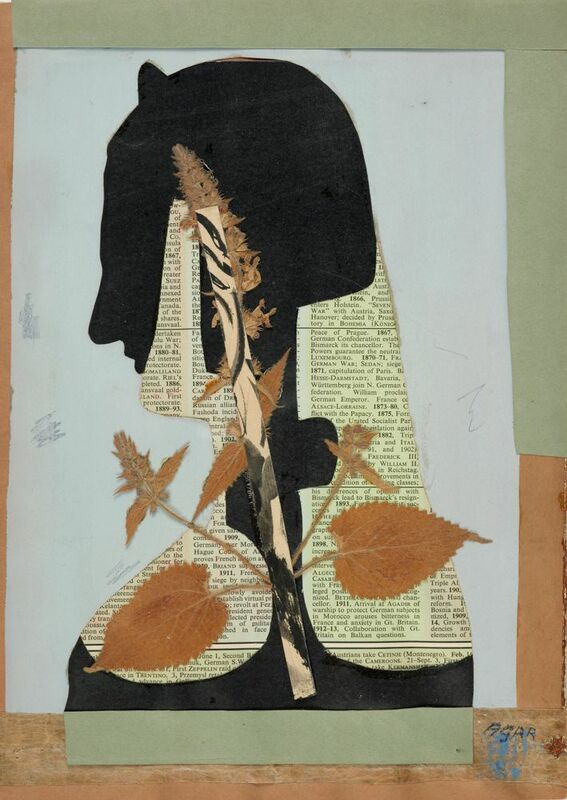 Nevertheless, I am not ashamed to accentuate the gaps in my collage literacy and to feature three noteworthy female artists: Eileen Agar, Nancy Spero, and Annegret Soltau. Examples of their work should have appeared here long before now. 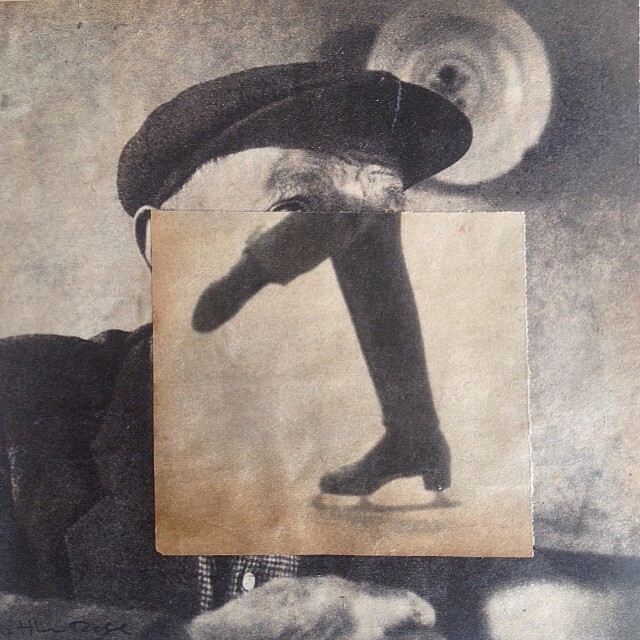 Awhile ago, someone asked a question about the trajectory of collage: “What’s Next?” To ponder that, I remind myself that one thoughtful critique is worth more than a ton of casual “likes.” Those of us who love this practice need to push beyond the comfort of mutual praise and communicate honestly about the medium of collage (not about our political attitudes). Don’t expect the lords of social media to provide a thumbs-down button. That’s not the solution (even if they do). There needs to be the virtual equivalent of the intense coffee houses and night spots of a century ago, where artists were not shy about challenging the easy answers and safe solutions. 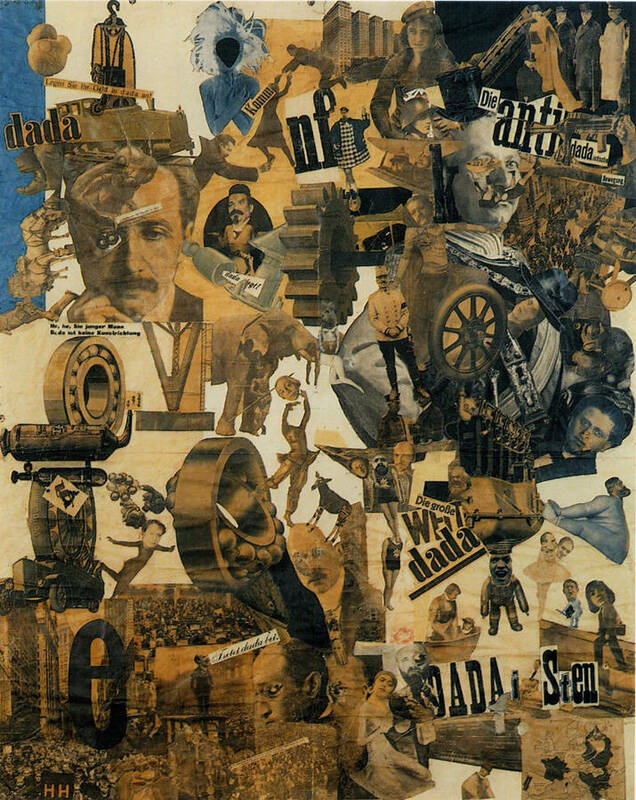 Warsaw-based designer/educator and blogger Annę Kłos describes Dada as a world view, that by its very nature could not be homogeneous, and that the seminal Merz of Kurt Schwitters was manifest within the context of internal incompatibilities. 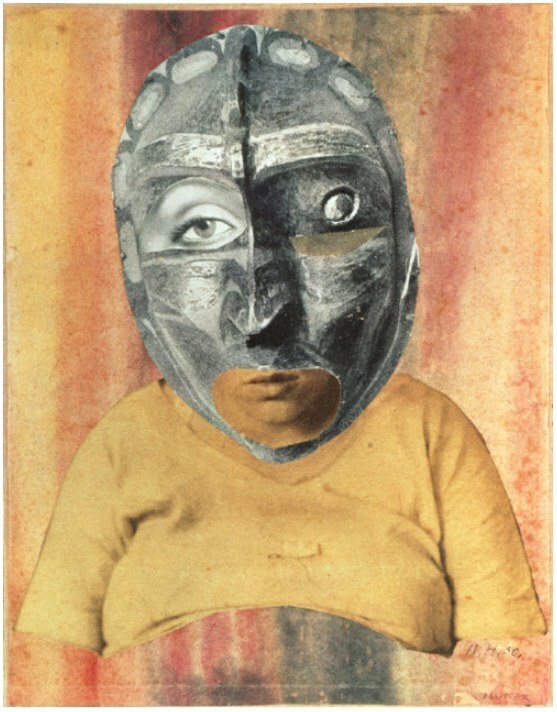 For the most part, however, many artists now tend to lump together the Dadaists, and emulate their visual and intellectual departures as an encompassing genre at best and a mere “style” at worst. — Time out. — This is when I grab myself by the scruff of the neck to keep from going off on an unnecessary tangent. 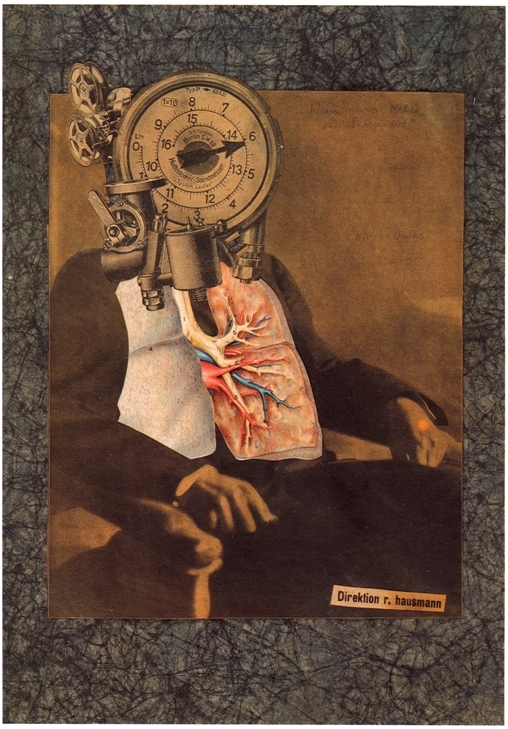 My purpose is to share an ongoing fascination with how Dada continues to influence those of us working in the medium today. 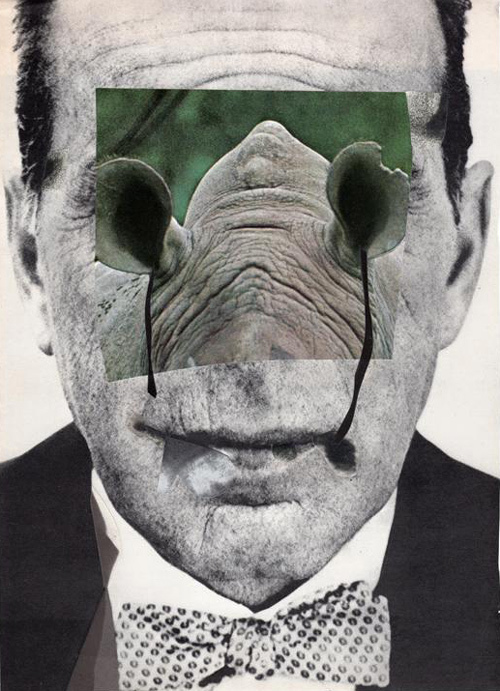 Permit me to highlight one particular “subject” that shows no sign of diminishing — the enduring exploration of the Surreal Face. 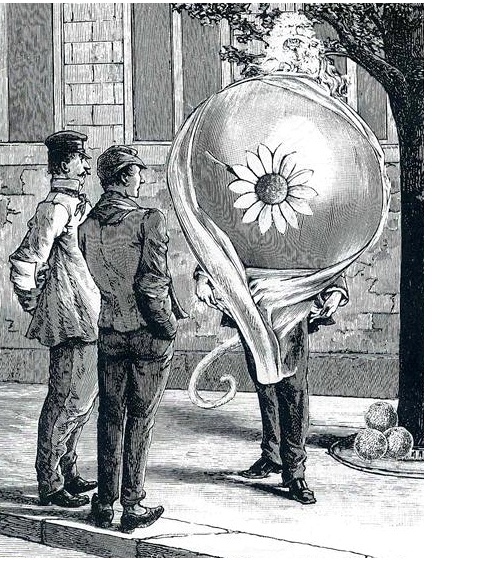 René Magritte’s Le fils de l’homme immediately comes to mind (or his much earlier cover image for André Breton’s Qu’est-ce que le surréalisme?). 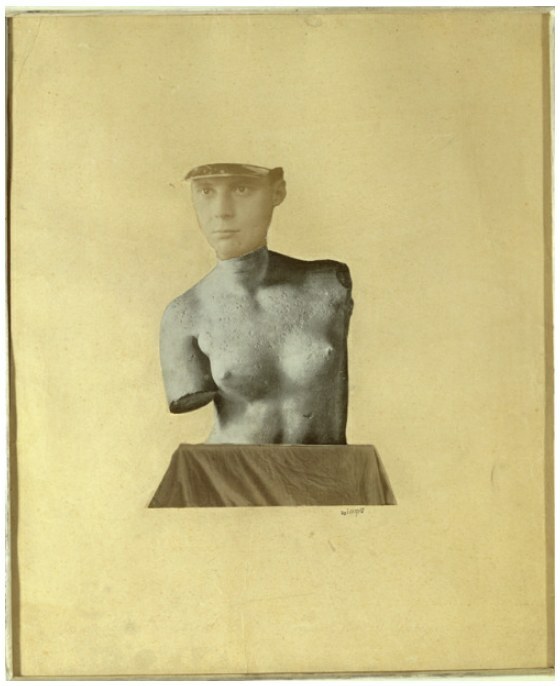 One must follow their roots to Dada, and to the photomontages of Raoul Hausmann and Hannah Höch, (or her The Strong Guys, or his Tatlin at Home). 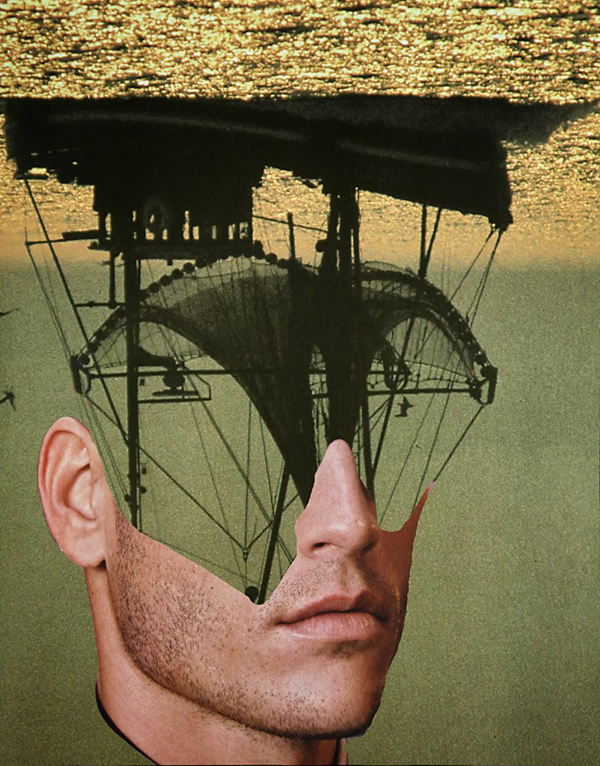 For me, nothing exemplifies the unsettling, elusive qualities of the Dada phenomenon better than when a contemporary collage virtuoso captures that inexpressible twist of incongruity and aesthetic finesse with a surreal take on the human head. Just when I think there is nothing more to be tapped, I appreciate anew how inexhaustible this “renewable resource” can be. 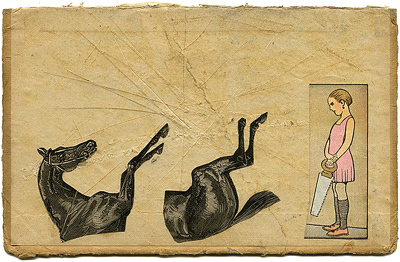 From her extraordinary “sketchbook” (Page 1). 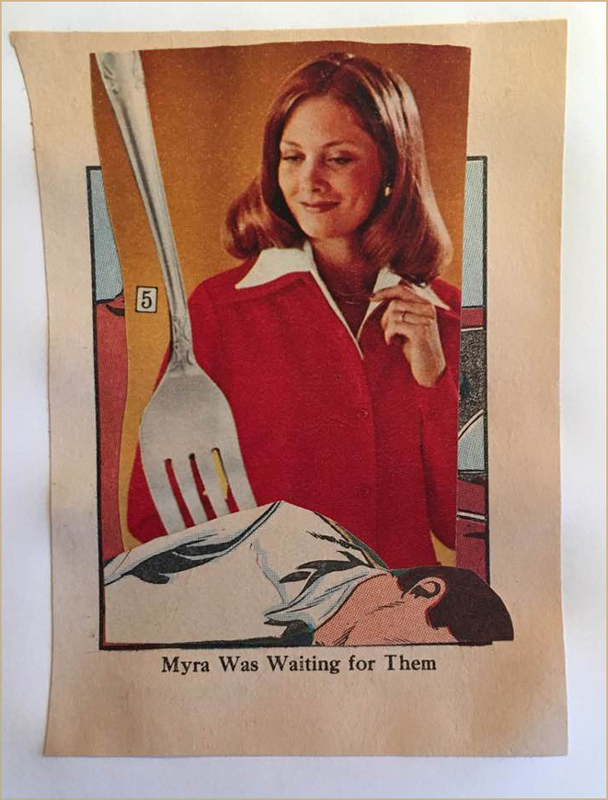 From her Loin Series. Does anyone else do more with less? The prolific Peggy Pop will find the sweet spot. 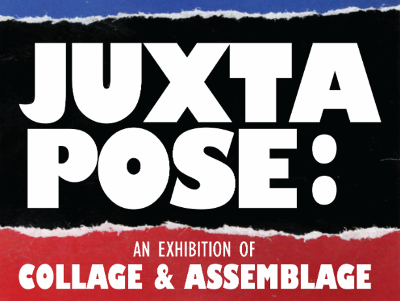 Much more about JUXTAPOSE . . . 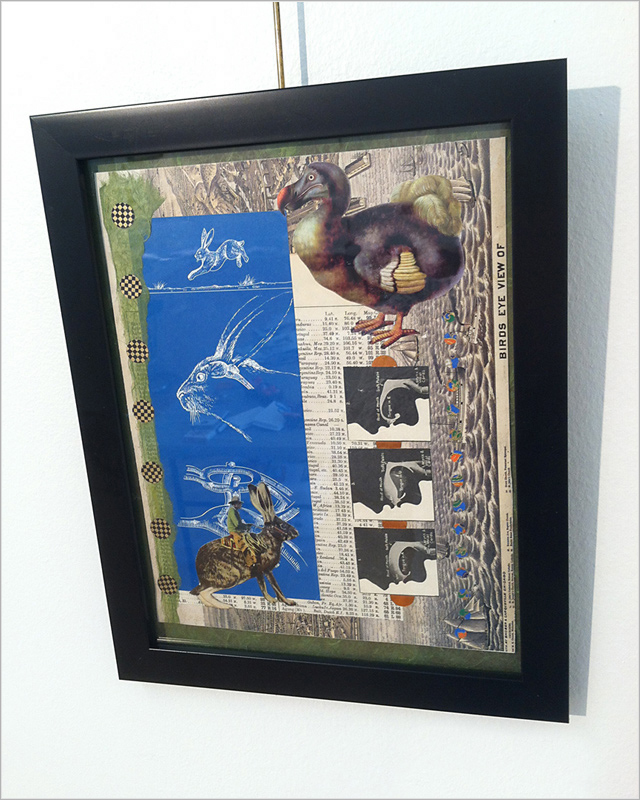 Friend and fellow collage artist Kathleen O’Brien is in the midst of her countdown to a big solo show in April. She asked me to do a favor and share a guest review as part of her final promotions for JUXTAPOSE before Drawn to the Earth requires her full concentration. As excited as I am about the group exhibition in Danville, it was a tougher post to write than I first anticipated. 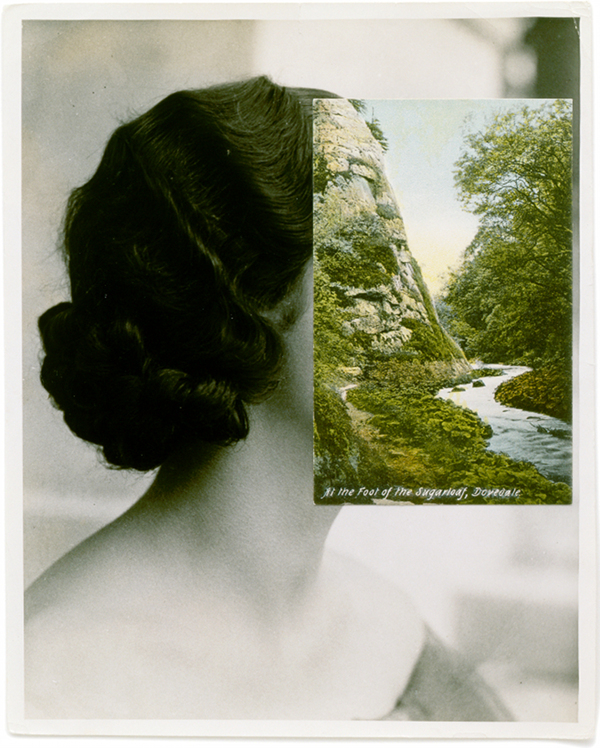 Collage is not the easiest art form on which to expound, perhaps because it relies on the “logic” of irrational choices. At any rate, my dedicating a blogsite to that very topic was nobody else’s idea, so I best not complain to those of you kind enough to visit here. Would I rather be making art? Of course. 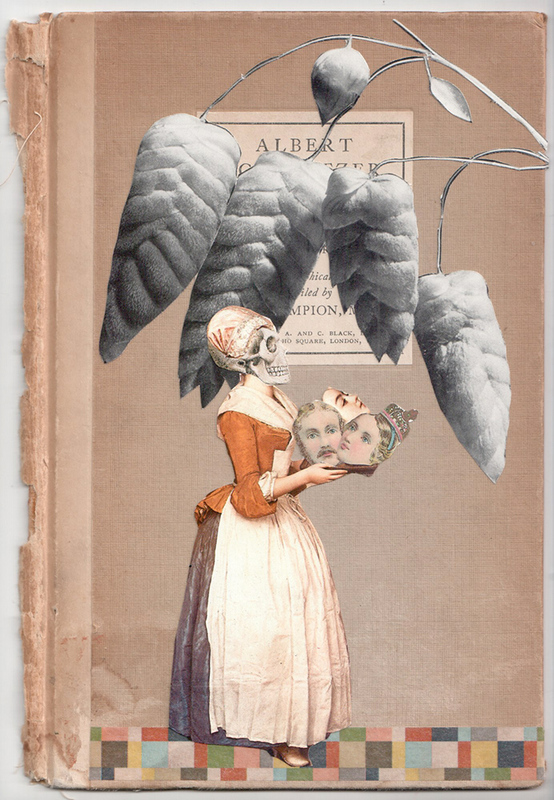 Even so, I cannot constrain my enthusiasm for all things collage. Here’s my take on a great show. Be forewarned: If you’re looking for some criticism, you won’t find it! I’ll admit it. 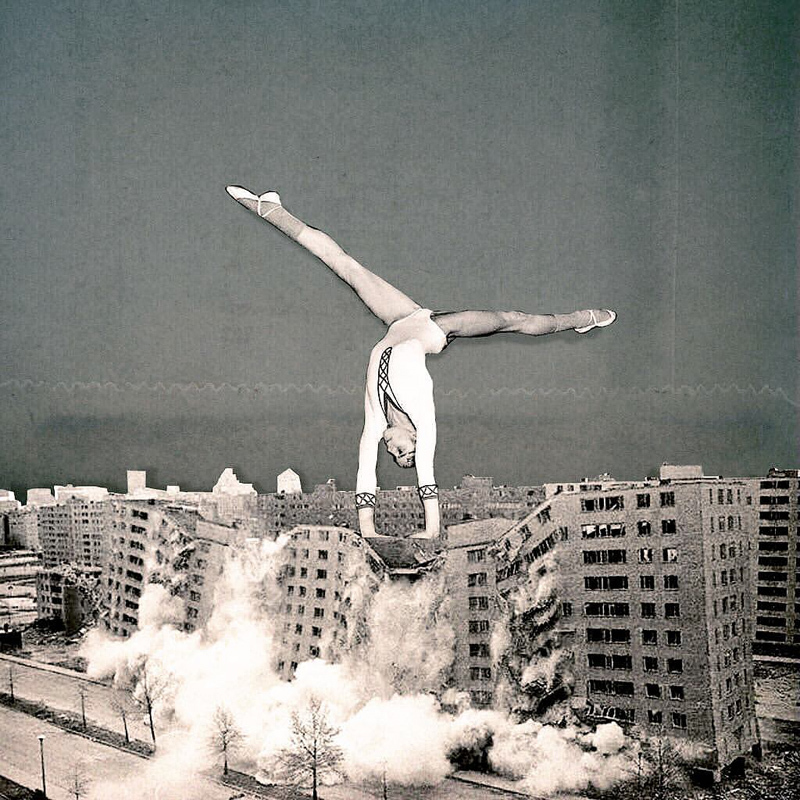 I can’t get enough of JUXTAPOSE. 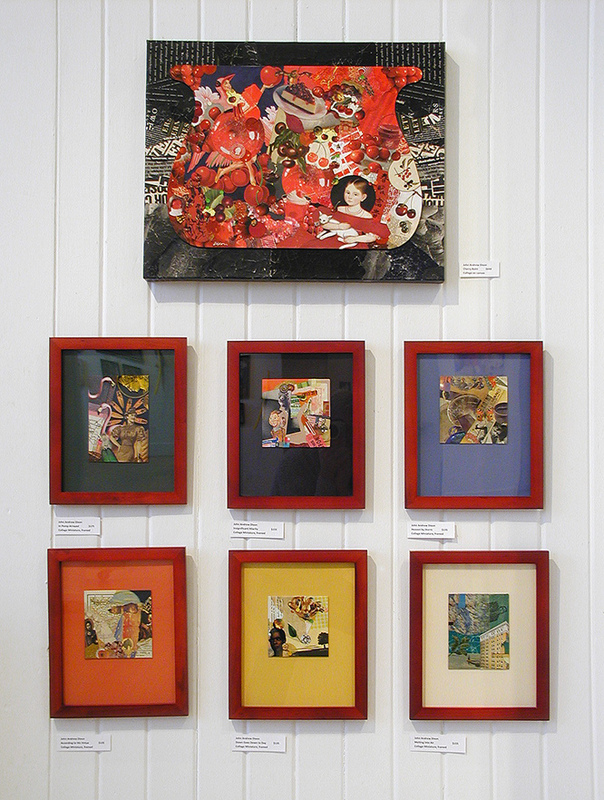 The current exhibition of collage and assemblage is at the Community Arts Center until April 2nd. That’s not exactly the most humble thing to say, considering it features a dozen works by yours truly, so I won’t pretend that I can offer an unbiased review. Program director Brandon Long has organized a finely curated, must-see destination that brings together over a thousand examples of the two associated mediums (literally, but I’ll explain that in a moment). This is an unprecedented group show for the Bluegrass-based artists involved, and I am thrilled to be exhibiting side-by-side with Kathleen O’Brien, Teri Dryden, Robert Hugh Hunt, Meg Higgins, Connie Beale, Cynthia Carr, and many others. No doubt my enthusiasm has something to do with its location less than a city block from my studio, which bestows the luxury of repeated immersions, and there is over a month left in the duration! There are more participants than I can profile individually, and far too many artworks to highlight. The best example of this is a room devoted to three complete year-long series of collage-a-day works by O’Brien, Long, and Nan Martindale. 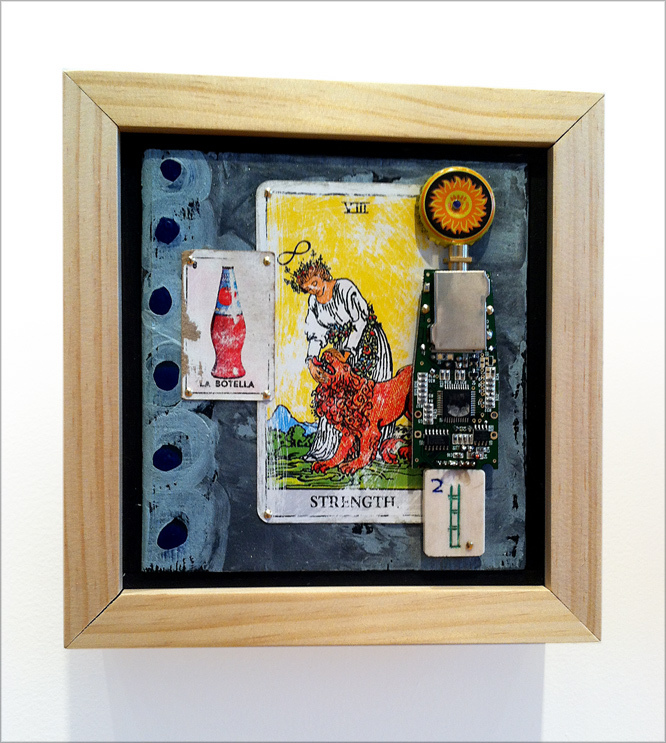 Combined with almost one hundred seventy of Robert Hugh Hunt’s provocative collage collaborations, the magnitude of miniature artworks presented in a single space could be overwhelming. As an exhibition designer, Long uses geometric grids, browsing boxes, and two flat-screen displays to make the huge collection comprehensible for viewers. 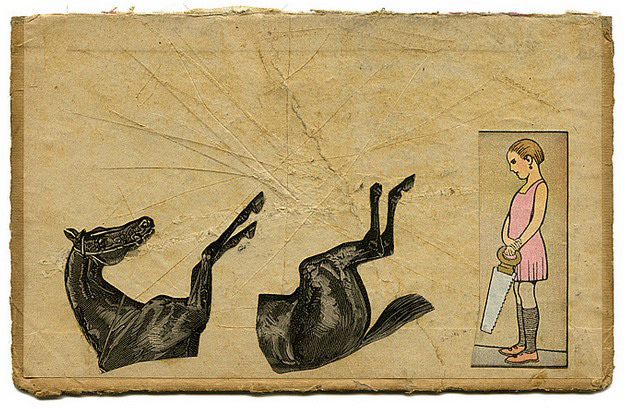 O’Brien’s sensitive, meticulously layered collection of daily two-sided postcards is a journey to which I surrender with pleasure each time I visit, but only after a jolting romp through Hunt’s rarely exhibited Hillbilly Voodoo series with T R Flowers. An opportunity to view works by six outstanding Louisville-based artists is worth the trip to Danville. 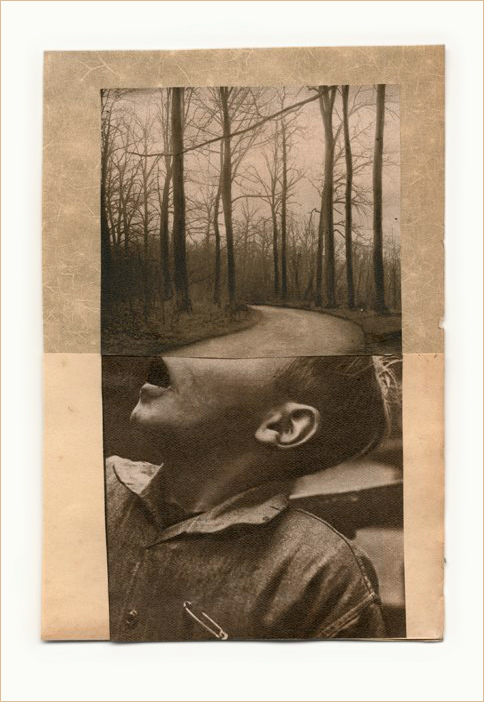 Several major works by Meg Higgins captured my first impression. Two enormous pieces composed with transparent elements sandwiched between Plexiglas are suspended between the vestibule and grand gallery. 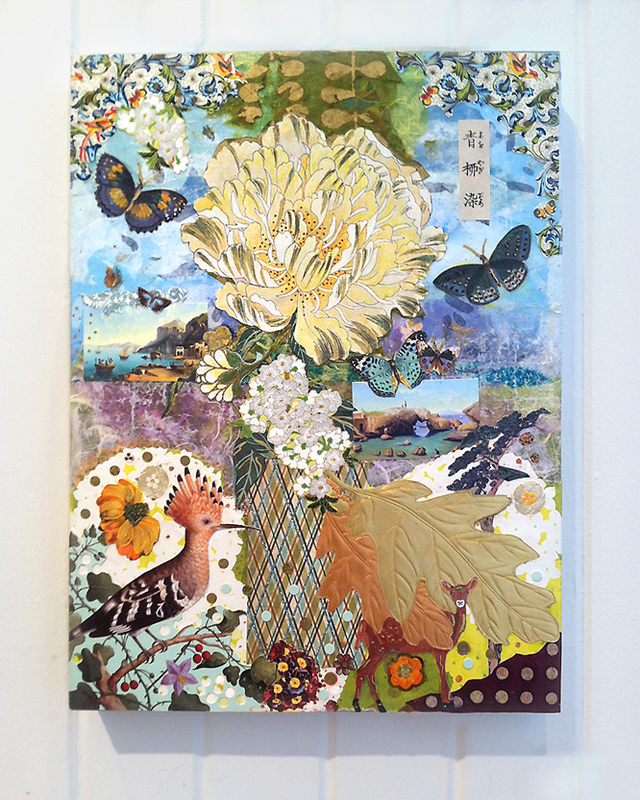 I was equally impressed by a smaller collage on wood panel, Japanese Peony Goes to Italy, with its exquisite East-West flavor. 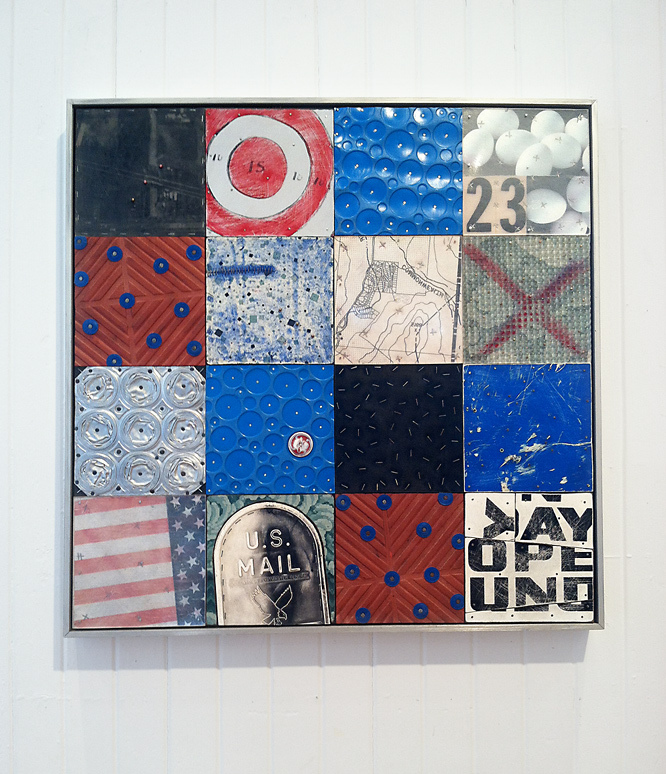 Brad Devlin’s solid but clever exploitation of found objects yields bold abstractions that simultaneously maintain a strong environmental essence. His Open Sunday is also physically more complex than it first appears, and this allows the artisanship of his assemblage to become a secondary experience deserving of scrutiny. Masters of juxtaposition who reinforce the theme of the exhibition as well as anyone taking part, Patrick Donley, Lisa Austin and Brandon Bass each define a distinctive individual style. 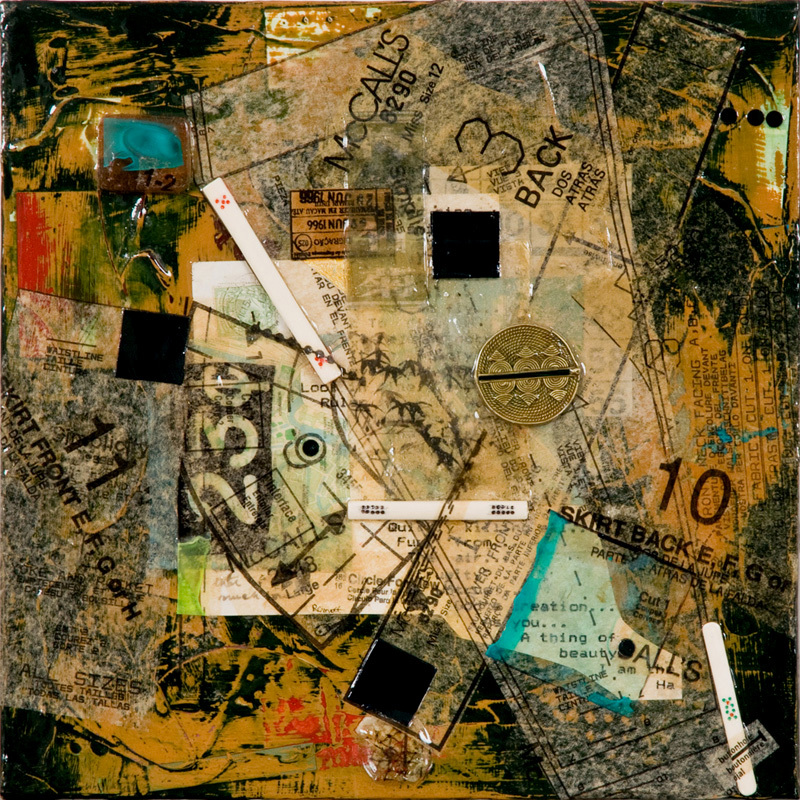 Approach to composition, color considerations, and a playful choice of ingredients form undercurrents that tie their pieces together, and Long knows how to modulate the walls in a way that makes groupings of their work satisfying to study. Although she has recently gained attention for her paintings, there are at least seven panels by Teri Dryden from a handsome body of work created from discarded books. Her Monteith’s Marrakesh exemplifies how her investigation successfully transcended the source material. Personally, I hope she rotates to collage again for another dynamic round of re-purposing cast-off items. 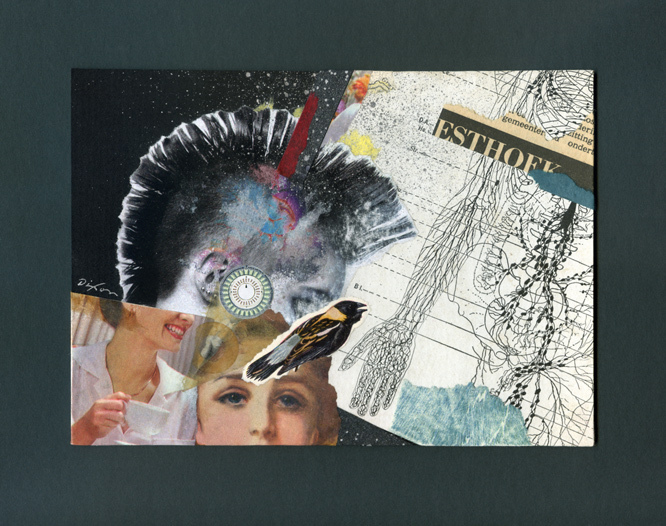 In addition to displaying a pair of shadow boxes, my only surrealist assemblage, and six favorite collage miniatures, JUXTAPOSE provides an opportunity to exhibit Bull’s-eye Nosegay for the first time, which I created for the Target Practice Project initiated by L T Holmes. 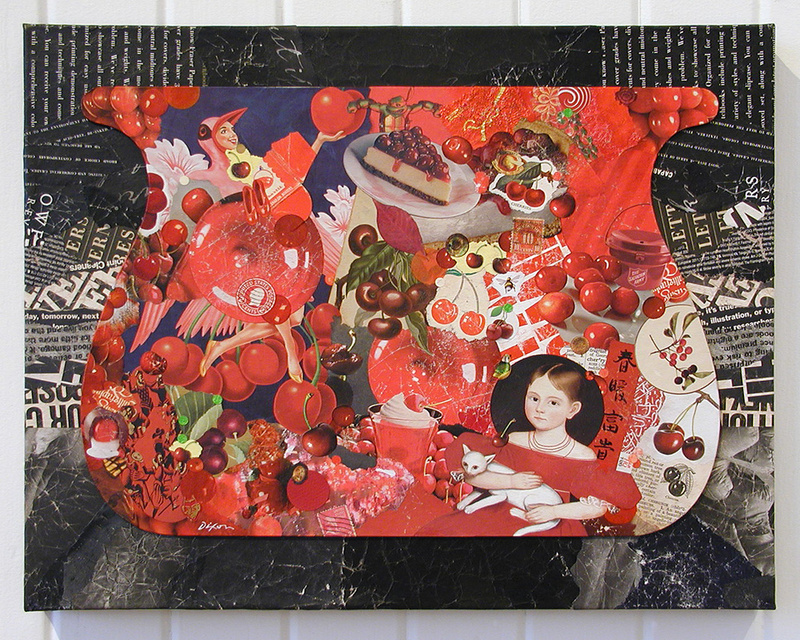 Also, I did two larger collage artworks especially for this show. Each makes more than a fleeting nod to artists who I admire. What is it about Cherry Balm that causes me to think I just might be “tipping my beret” to the inimitable Matthew Rose? Reliquia is my tribute to the late Fred Otnes, a giant within the medium who has been a force in my consciousness since adolescence. Pearallelograms was held over from the previous exhibition at the institution, but the crowning delight for me may well be the presence of Kentucky Madonna, last year’s “finish” by Robert Hugh Hunt to my “start.” The collaborative piece is a companion to one currently hanging with the IT TAKES TWO exhibition of collaborations at the Kentucky Artisan Center in Berea. Robert and I can’t ask for more than to know that both are now available for public observation (unless someone wants to give them a good home). I am no art historian, but I can’t help but be mindful of the pioneering artists who laid a hundred-year foundation for the sweeping diversity of this exhibition. The creative innovations of Picasso, Braque, Duchamp, Schwitters, Höch, Cornell, Johnson, and Kolář reverberate throughout the building. 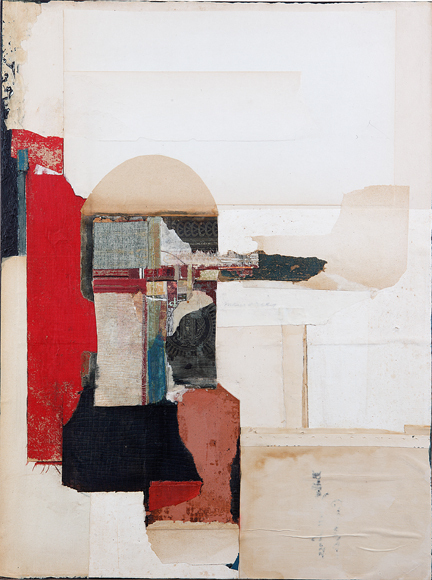 In many respects, all contemporary collage/assemblage is a tacit homage to these seminal influences, but that is never the only thing at work nor the only phenomena to be perceived when one indulges an exhibition of this scope. Most artists are striving for a personal means of expression informed by those who have made their enduring mark on a medium. 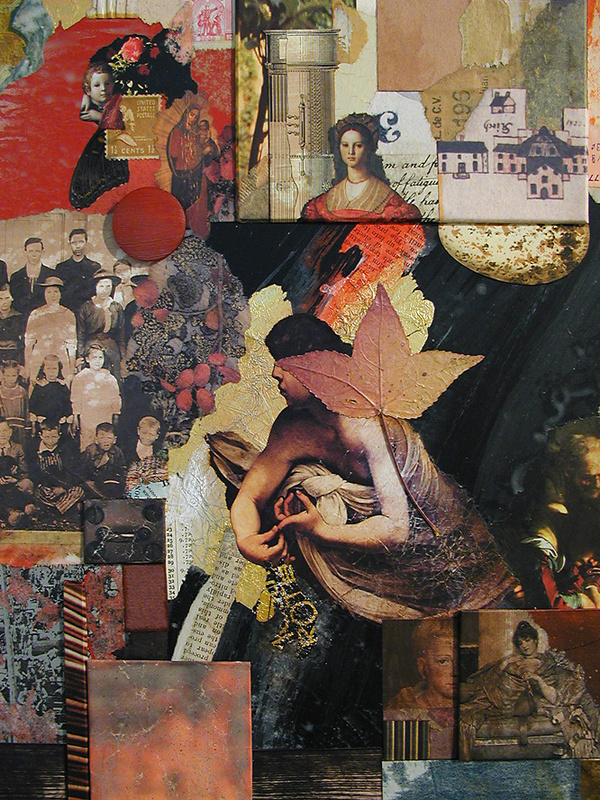 I am convinced, more than ever, that what distinguishes contemporary collage/assemblage artists is their keen connection to the mundane “stuff” of culture and the inner need to bring a measure of order and harmony from the sheer volume of material produced by our throw-away society, with its chaotic effect on our sensibilities — to create value where none exists, or to find wonder, meaning, significance, and beauty where none can be expected. 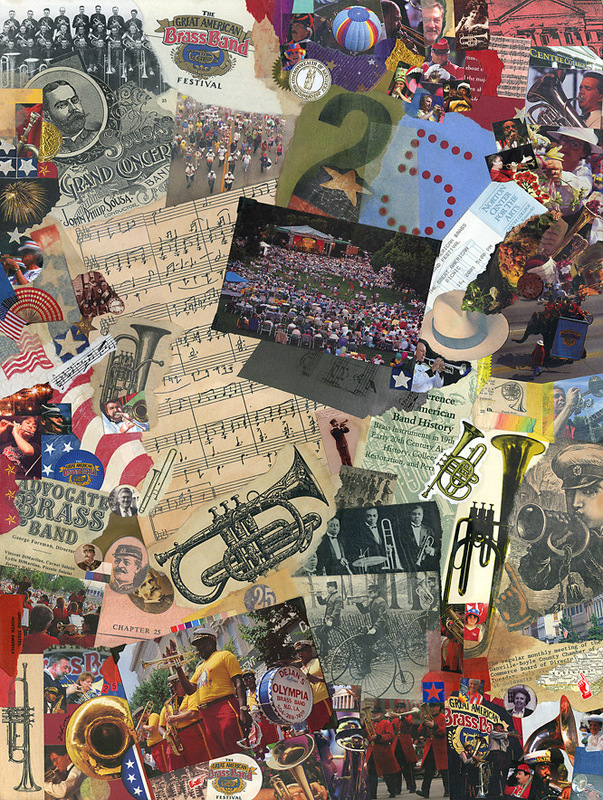 The Great American Brass Band Festival’s milestone 25th event is now in the archives. The finale was one of the most satisfying concerts in the history of the Kentucky festival. My appreciation goes to those who made it all happen one more time! I am pleased to have played a small part. 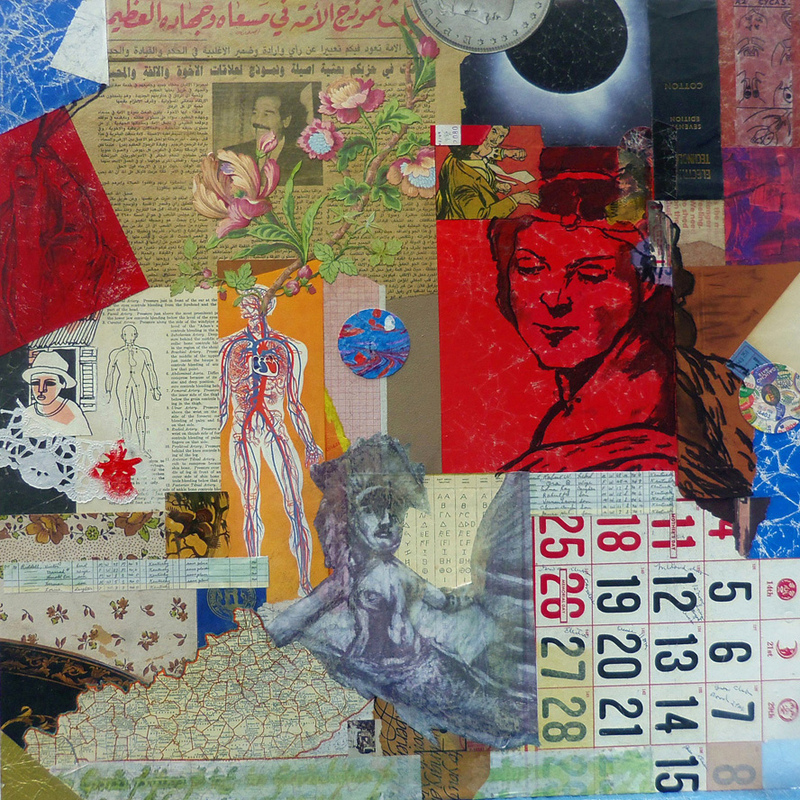 When I was first approached about lending my creative experience to the effort, I pitched the idea of a traditional collage to mark the 25th, using scraps from memorabilia of the last quarter century. A decision was made to go a different direction, but I could not put the idea aside. The result is “Brass 25,” a tribute to my community’s exceptional contribution to the American musical and cultural scene. 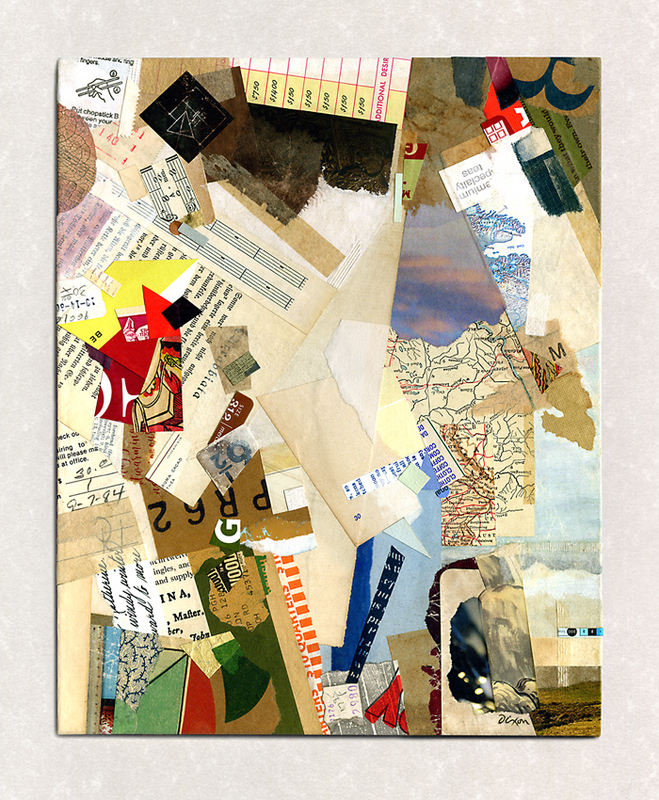 Is “commemorative collage” art? Perhaps not. Some might make the case that no example of the medium has approached “high art.” In my opinion, such a viewpoint fails to consider the 100-year impact that the medium has had on our visual landscape and the evolution of our aesthetic perceptions. 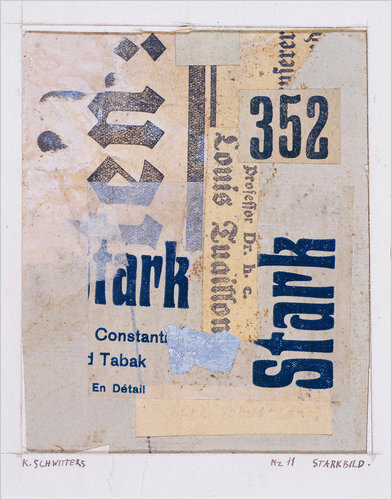 It neglects the seminal role of Schwitters, Höch, Cornell, Kolář, and others. 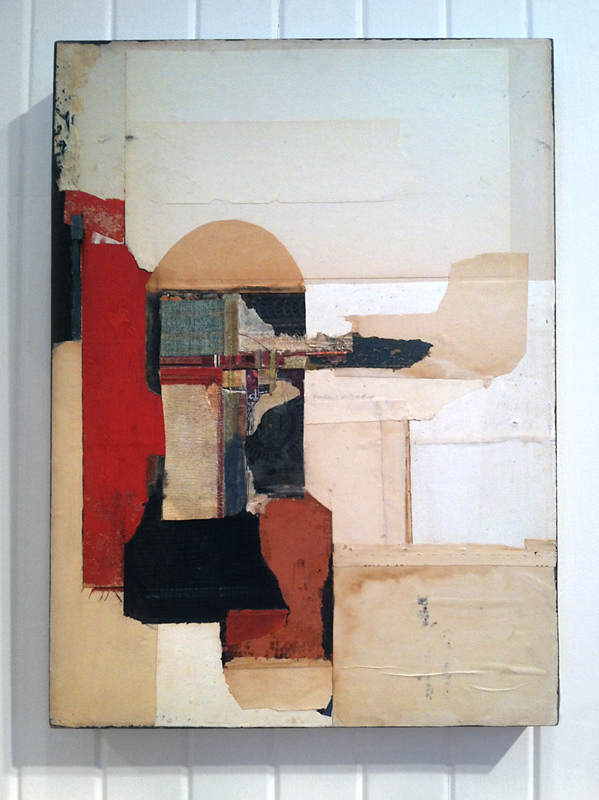 For me, the core relationship between mundane material and the art of collage transmits a unifying principle. 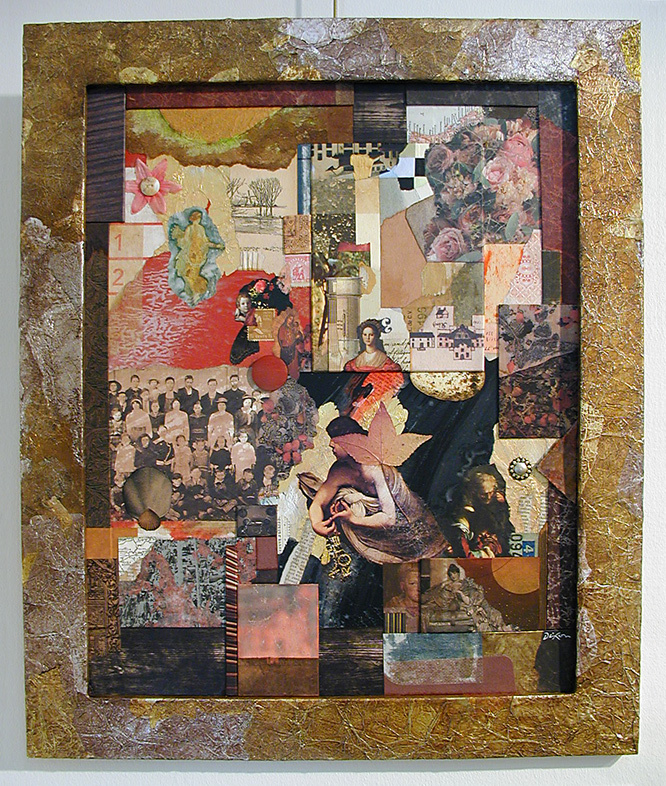 When the remnants of ordinary life are physically re-purposed to resolve a unique compositional harmony, the culminating artifact can achieve a transcendent tone and offer a shared experience with each participating observer. If that is not art, stripped of elitist notions, then what is? I’m keen on art history to quench a dry spell. 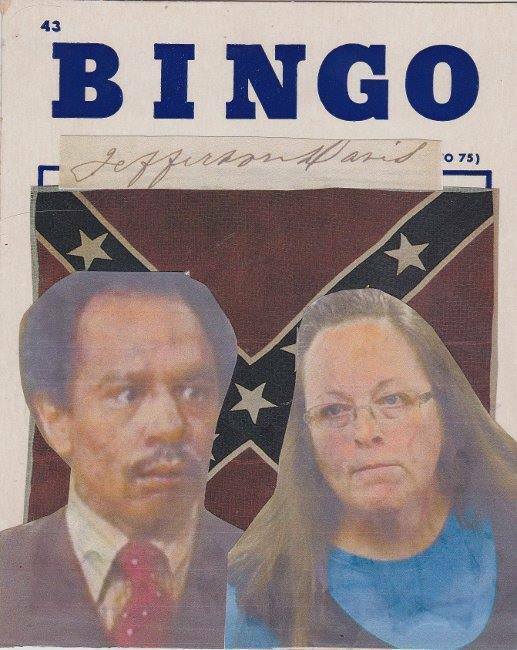 Here’s my suggestion to a collage artist in a slump. 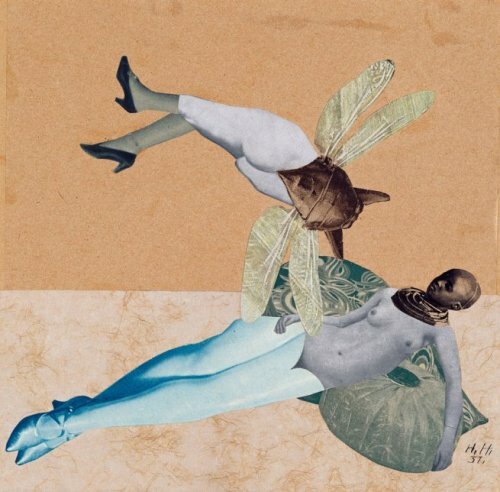 • Browse modern art movements that have influenced collage: cubism, dada, constructivism, expressionism, surrealism, pop art. 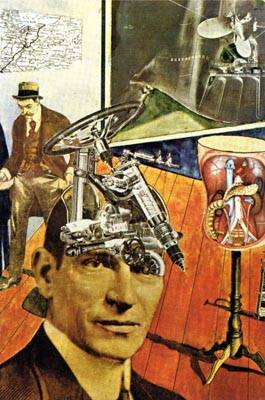 • Relax and study the seminal masters of the medium: Cornell, Paolozzi, Höch, Hausmann, Schwitters. 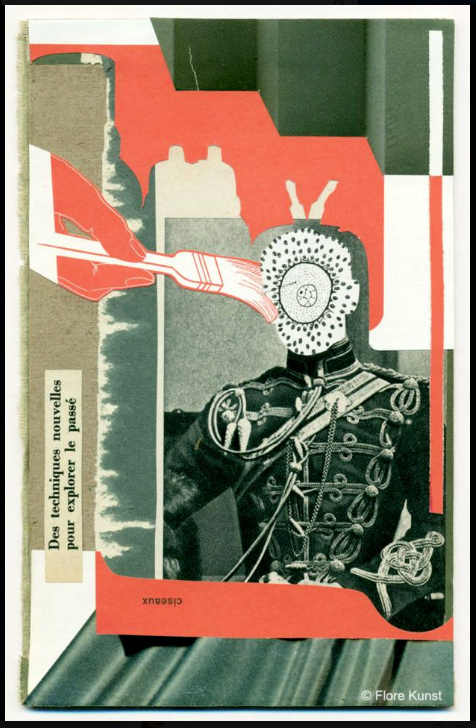 • Then go to your “morgue” of images, textures, ephemera, and found material: group various ingredients into piles, responding quickly, intuitively, and without conscious thought for composition or symbolic associations. • Before you know it, you’ll have more ideas and embryonic projects than you can immediately deal with. React first to the ones that won’t be denied. With a bit of luck, a new series will emerge. When I hear artists say they try to limit their influences, I think, “Nonsense.” Outside of some strange brand of sensory or cultural deprivation, it is simply not possible to avoid influences. That being said, why not regularly go to the masterworks and primary sources for direct, conscious influence to balance or offset the continuous bombardment of visual input from a culture steeped in nth-generation bastardizations? 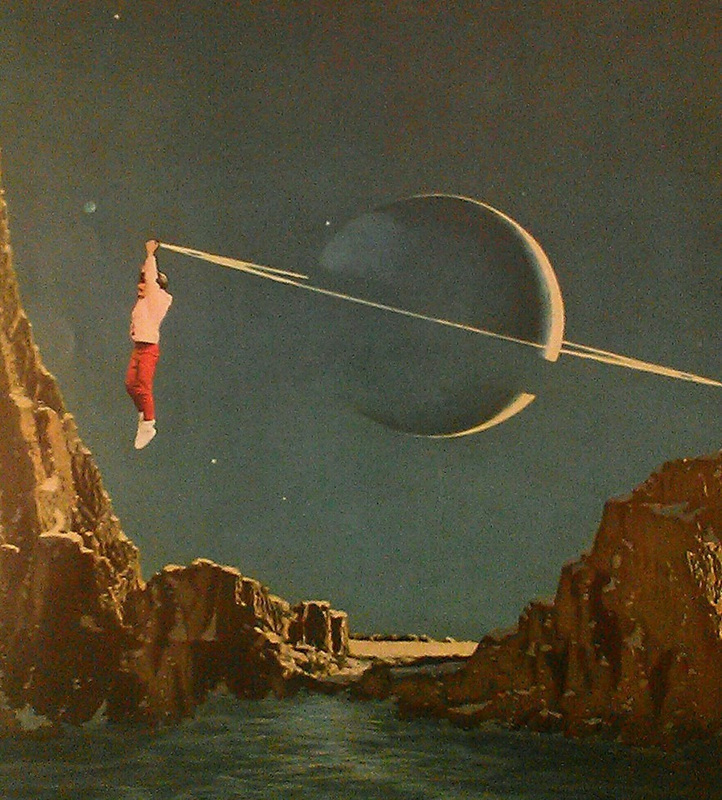 One cannot drive down a street, walk through a shop, or scan the media without being influenced in some way by a legion of art directors, graphic designers, and photographers—and these individuals may or may not have any direct knowledge of how they are re-cycling the ideas of innovative artists. Great writers understand where the basic narrative modes originated. Serious filmmakers know who first did this or that—a dream montage, in-camera trick, or other cinematic effect. One cannot imagine a Morricone who did not know a Beethoven who had never listened to Bach or Haydn. There is no way to conjure up an Emerson who did not know a Montaigne who had never read Lucretius or Diogenes. 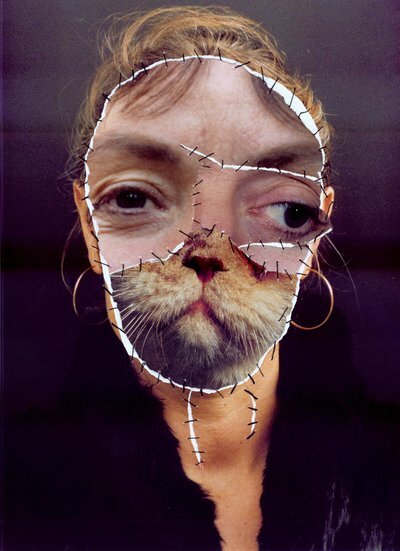 You are currently browsing the archives for the H Höch category.